There’s not a lot for a young or much older person to do in the South Macon area of Macon, Georgia. There aren’t many places to go within the neighborhood. The closest park or recreational center is more than five miles away. South Macon Arts Revitalization Technology (SMART) was created in 2015 to “enhance the community by redefining the culture of an area that is marginalized and seemingly forgotten.” The all-volunteer, grant-funded effort uses an “asset based” community development approach to its work, meaning it builds on the talents, resources and interests that already exist within the community. 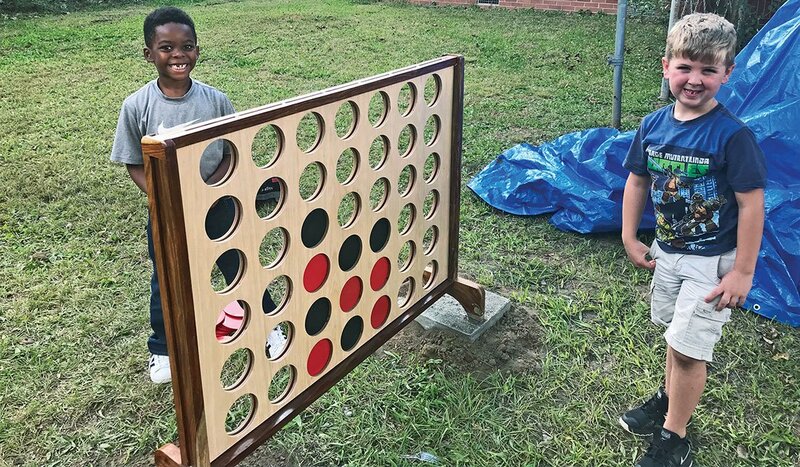 Recognizing that years ago — before 24/7 television, air-conditioning and smartphones — sitting outside and talking over a game of chess or checkers was a popular pastime, SMART used funds from a 2017 AARP Community Challenge grant to purchase outdoor checkerboard tables and two oversized Connect Four games. A crew of neighborhood residents serve as volunteer game instructors. 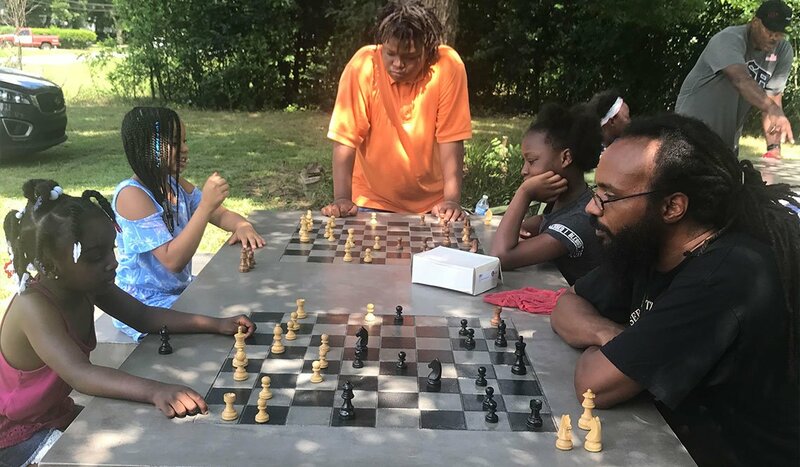 "We're noticing that as the teachers assist the children ages 5 through 16 with learning the games of chess and checkers, the students who have short attention spans are learning how to focus more," observes Lewis. "It's interesting to see how the very young children are showing interest." 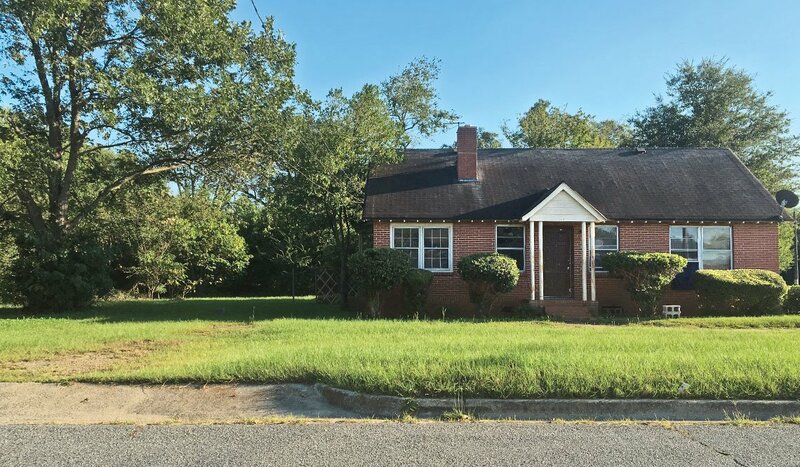 This church-donated house and yard on Lymore Avenue in Macon, Georgia, is evolving into a community center and neighborhood park. In addition to the already-installed checkerboard game tables, there are plans for a fenced playground and basketball court with lighting so the space can be used at night. 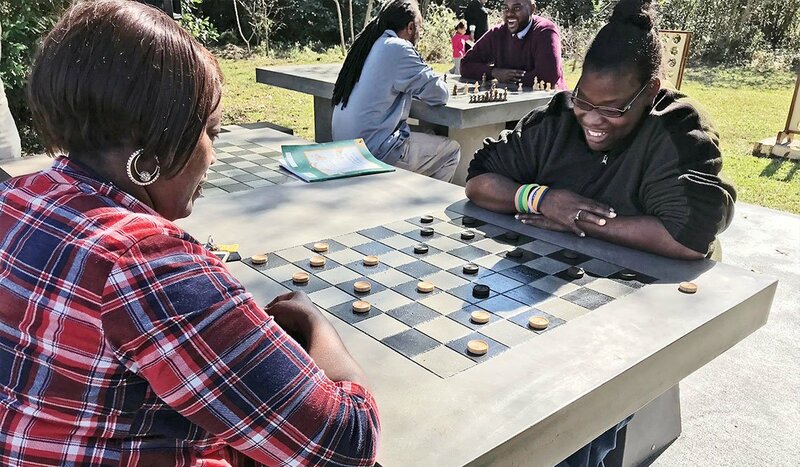 When the checkerboard game tables were unveiled on November 2, 2017, people of all ages showed up to play. An all-volunteer team of adults serve as SMART's official chess instructors, and skilled young people chip in to help as well. The park's oversized Connect Four game is a handy option for children who don't want to sit at a table and concentrate on playing checkers or chess. South Macon Arts Revitalization Technology (SMART) was a recipient of a 2017 AARP Community Challenge grant. This article was adapted from the "Create Thriving, Productive Communities" chapter of Where We Live: Communities for All Ages — 100+ Inspiring Ideas From America’s Local Leaders. Download or order your free copy.